The Trader Joe's near Rosslyn has plenty of bike parking nearby. Along the sidewalk on the block in front of the store are seven steel loops for bike parking. In addition, a bike rack is available just past the entrance booth for the underground inhuman-powered vehicle parking (entrance on Garfield St.). 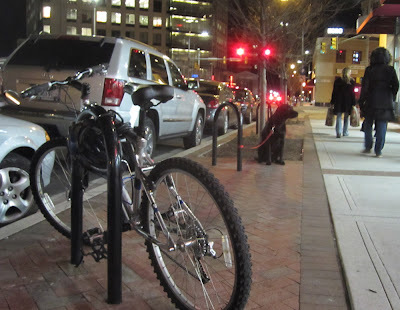 If you have a well-behaved dog, the steel parking loops in front of the store are also handy for dog parking. This past Thursday night, a black Labrador parked there was giving passers-by a clinic in calm patience. The bike parking aside from the car park is welcome. However, there were concerns about the safety of the dogs on that establishment. Thank you for helping this way, Tai. When I was still a city girl I did some shelter work, taking puppies to elder care places for visits. Taking them back to the shelter was always so sad- but you do what you can do and it does make a difference in their days.